Late in the afternoon of Saturday 30th July 1966 the captain of the English football team Bobby Moore took the Jules Rimet trophy from the Queen of England and lifted it above his head, acknowledging the acclaim of a packed Wembley crowd; England had beaten West Germany 4-2 to win the World Cup in an epic match full of excitement and controversy. This was the culmination of a successful campaign wrought by the England team and backroom staff, in particular the England manager, Sir Alf Ramsey. The setup behind the England team had been gradual changing and Ramsey was only the second England manager, previously an FA committee had selected the teams. More importantly, Ramsey wrenched control of actual team selection from that committee; his predecessor, Sir Walter Winterbottom, could only advise. One other key aspect of Ramsey tenure, at least in those days, was that he would use players who were displaying good form at the time, rather than using the same players all the time. This was the background to the crucial decision to pick Geoff Hurst over Jimmy Greaves, arguably a technically superior player. History backs Ramsey, as Hurst was the first, and so far only, player to score a hat-trick in a World Cup final. The first round matches were tough and sometimes dour, as football was going through a stage when defensive tactics were evolving. England had also had some stormy meetings; their quarter-final match with Argentina featured the first sending off in an international at Wembley, the Argentinean captain Rattin. Germany had romped past Uruguay 4-0 then won a hard-fought match 2-1 against Russia in the semi-final. Worryingly, that was the first goal Germany had conceded in the whole tournament. The pre-match discussion was all about that controversial decision to leave Hurst in the number 9 spot (this was before the days of squad numbers and the power of shirt marketing). He had replaced an injured Jimmy Greaves for the group match against Argentina and scored the only goal, so Ramsey kept faith even though Greaves was passed fit for the final. England went behind in the 12th minute, Haller picking up a mis-directed header out by Ray Wilson, but they levelled through Hurst six minutes later, after a quickly taken free-kick. The rest of the half continued with England just about on top but being unable to break through a well-organised West German defence. 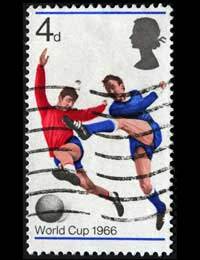 In the second half it was England’s turn to go ahead as Martin Peters followed up a deflected Hurst shot, then in the final throes of the game, Germany equalised. Again, England were marginally superior but had not been able to convert that into a sustainable lead. Half-way through the first period of extra time, Hurst met a cross from Alan Ball and his shot on the turn hit the underside of the crossbar and bounced down to the goal line. The referee signalled for a goal and then, under pressure from the German side, consulted with the linesman, who confirmed the goal. Whether or not the ball actually crossed the line is still hotly disputed in Germany, but the over-riding rule is that the referee’s decision is final, so it was a goal even if the ball didn’t cross the line. So there. The ‘Russian’ linesman was actually from what is know known as Azerbaijan, and at the time he was listed as coming from the USSR, which to everyone in the western world then meant ‘Russia’, even though that was technically incorrect. The game is disputed on many counts, the final goal is disputed in Germany as the keeper was distracted by the invading fans, which means that they can dismiss two goals and claim a moral victory. Equally though, English fans will point to the apparent handball during the goal-mouth scramble which lead to the German’s last-ditch equaliser that put the match into extra time. And in any case, the free-kick that lead to the scramble was dubious too, so those two disputed goals would never had happened or counted.